Silicon Labs has introduced a fully integrated, pre-certified Bluetooth Smart module solution that gives developers the fastest path to low-power wireless connectivity for the IoT. The BGM111 module is the first in a family of advanced Blue Gecko modules from Silicon Labs delivering best-in-class integration, flexibility, energy efficiency and toolchain support with an easy migration path to Blue Gecko SoC solutions. The BGM111 Blue Gecko module simplifies Bluetooth Smart design and accelerates time to market for a wide array of applications including smart phone accessories, beacons, connected home devices, health and fitness trackers, personal medical devices, automotive diagnostics, industrial sensors and point of sale terminals. The BGM111 module abstracts the complexity out of RF design, the Bluetooth Smart protocol and embedded programming. 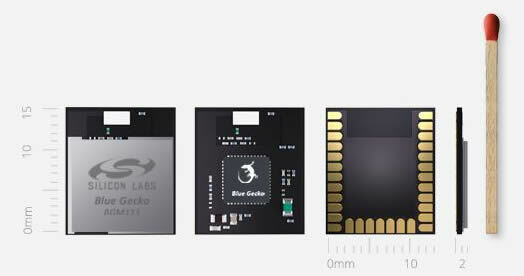 Silicon Labs’ Blue Gecko portfolio provides developers with the flexibility to begin Bluetooth development with BGM111 modules and then transition to Blue Gecko SoCs when needed with minimal system redesign and full software reuse. Customers who need the opportunity to optimise BOM and reduce R&D cost can begin designing with the module for faster time to market and minimal design effort, and then later migrate to a Silicon Labs Blue Gecko SoC-based design with a seamless software experience. The BGM111 module is supported by the most efficient development environment in the Bluetooth market. Silicon Labs’ wireless SDK gives developers the flexibility to use either a host or fully standalone operation through the easy-to-use Bluegiga BGScript scripting language. Using a familiar BASIC-like syntax, BGScript enables developers to create Bluetooth applications quickly without using external MCUs to run the application logic. All application code can be executed on the BGM111 module, eliminating the need for an external MCU, which helps reduce cost and board space and speeds time to market. Bluetooth Smart application profiles and examples are also available to streamline development. The BGM111 modules incorporate all features of Blue Gecko SoCs and come with 256kB flash and 32kB RAM, providing ample memory for onboard applications. The SoC’s built-in hardware cryptographic accelerator offers the assurance of a future-proof roadmap for evolving security requirements. Flexible hardware interfaces enable easy connection to a variety of peripherals and sensors. An integrated, high-efficiency antenna makes RF design and operation consistent and straightforward for developers of all skill levels. The BGM111 module’s ultra-low power operation enables Bluetooth Smart systems to be powered from a standard 3V coin cell battery or two AAA batteries. The SoC’s integrated ARM Cortex-M4 processor-based MCU consumes 59µA/MHz in run mode and only 1.7µA down to 200nA in sleep mode. The SoC’s on-chip Bluetooth Smart transceiver consumes only 7.5mA in peak receive mode and 8.2mA at 0dBm in peak transmit mode. The transceiver also provides the industry’s most flexible transmit power, configurable up to +8dBm and supporting exceptional line-of-sight RF range of up to 200m. Pre-production samples of the BGM111 Blue Gecko module, supported by the SLWSTK6101A Blue Gecko wireless starter kit, are available now for engineering evaluation and prototyping. Volume quantities of the module are planned for Q4. The module’s 12.9x15x2.2mm form factor is suitable for a wide range of space-constrained applications. BGM111 module pricing begins at $4.97 in 10,000-unit quantities, and the SLWSTK6101A starter kit is priced at $150 (MSRP).